"That inning I had kind of lost my feel a bit. Couldn't point a finger to why," Verlander said. "The tying run scoring was a little disappointing. ... But once that happens, then you've got to reset and not relinquish the lead." "We'll see tomorrow," Boston catcher Sandy Leon said. In a rematch of last year's Division Series opener, when the Astros hit back-to-back homers in the first inning and pounded Sale for seven runs in all, Verlander improved to 13-2 in the AL playoffs. 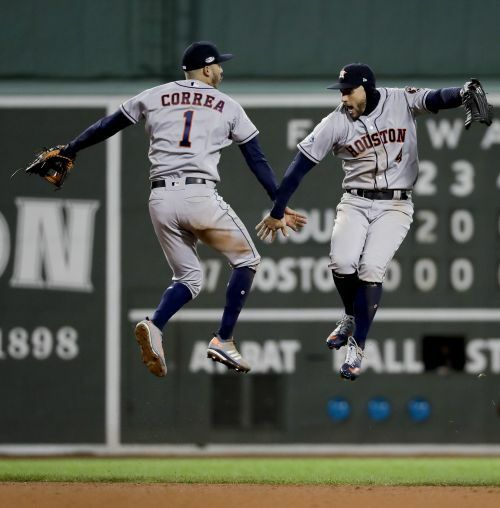 Houston only got one hit off of Sale, but he loaded the bases with two outs in the second on two walks and a hit batter before reigning World Series MVP George Springer singled in two runs past the glove of third baseman Eduardo Nunez , who slipped as he stretched for the ball. "Anytime you get two quick outs then you load up the bases and give them two runs, that's not what you're looking for this time of year," Sale said. "I just went out there and lost it for a little bit. I felt like I was battling myself for a little bit. I was trying to limit the damage and get out there as quick as we can." The Red Sox went down in order in the second, third and fourth innings before awakening the shivering, sold-out Fenway crowd in the fifth with Steve Pearce's single — just their second hit in the game — and two walks. Verlander walked a third batter in a row, forcing in a run. "You can look at it two ways," Red Sox right fielder Mookie Betts said. "They pitched their way out of it, but we didn't hit our way into it." "I guess Verlander executed his pitch, and he called it a strike," Cora said. "Andrew didn't agree. I didn't agree. It's a big pitch right there. It's ball four, bases loaded. ... Most likely Verlander comes out of the game. "But you can't argue balls and strikes," he said. "And I did." Houston took advantage of another hit batter in the sixth — this one by reliever Joe Kelly — and Nunez's fielding error on Gurriel's grounder to take a 3-2 lead. Reddick and Gurriel homered off Brandon Workman. "The tying run scoring was a little disappointing," Verlander said. "But once that happens, then you've got to reset and not relinquish the lead." "I still like our chances," he said. "We've got D.P. on the mound and we got a bunch of guys in here that are fired up over tonight. We're not gonna hang our heads in the locker room. We're not gonna give up. This is the time when we kick in gear and start fighting." Price, 16-7 in this year's regular season, has two postseason wins in relief in his career. Cora insisted that he had faith in Price, and he told the 2012 AL Cy Young winner as much after the Red Sox eliminated the Yankees in the previous round. "Alex told me before we even got off the field that night" that he would get another start, Price said before the game. "So for him to tell me before we even took our jerseys off to put on our postseason shirts that we get when we win, that was special."